I use a sentence strip holder to place vocabulary words. It also shows students the objective of the day when they enter class. Students are not allowed to sharpen pencils. If they have one that needs sharpening, they come up to the counter and trade it in for a sharp one. If a marker doesn’t work anymore, I have them put it in the “bad marker” box. Later, I take off the cap (save for sculpture projects) and use the insides for making colored glue or the whole marker for liquid watercolor! Open up bottom of old marker. Might need sharp scissors or something sharp. BE CAREFUL. Pull out fiber tube. 1. Gather together old markers with the caps off. 2. Place several of the same color into a small cup of water. 3. The next day you will have instant watercolors. It really does paint beautifully! I write down every project that each grade level does and materials used so if I miss something (or run out of time) I can make sure the group gets a chance to work with the materials the next year. 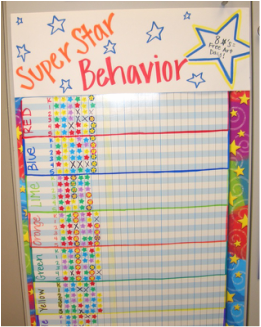 Each day the class earns a “star” for good behavior. I have a student put a "star" on the sticker chart when they earn it at the end of class. When they earn 8 stars the whole class earns a “Free Art Day.” On that day they may draw from drawing books, cut and glue, use play-doh, texture plates, build sculpture with Legos, etc. I only see my students once every 7 school days, so they might earn 2 or 3 Free Art Days the entire year. If a student’s behavior interrupts learning, a pre-written note is sent home for behavior documentation. I just circle the rule broken. 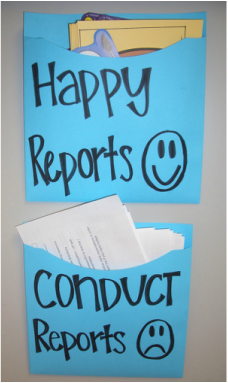 When a student shows exceptional behavior characteristics in art class, a “happy report” is sent home describing their behavior ( I use an “artsy” notepad bought from a teacher store. Just rip off a few pages and put into pocket). They get to pick which one they want from the pocket.